And while I take a moment to reflect on all of the goodbyes we have endured these last ten years, I find myself being thankful for all of the hello-agains. In this family, we have been blessed to have the reunions that so many families go without. Lovely moment captured. Thank you for sharing! I was watching Ellen yesterday and she showed a video of a daddy soldier coming back to his family. Of course they always make me cry. I'm tearing up now just thinking about it! Noah asked why I was crying so I was explaining that it was a happy moment. I teach him a lot about how his dad was in the military and how he had to be gone for a long time. 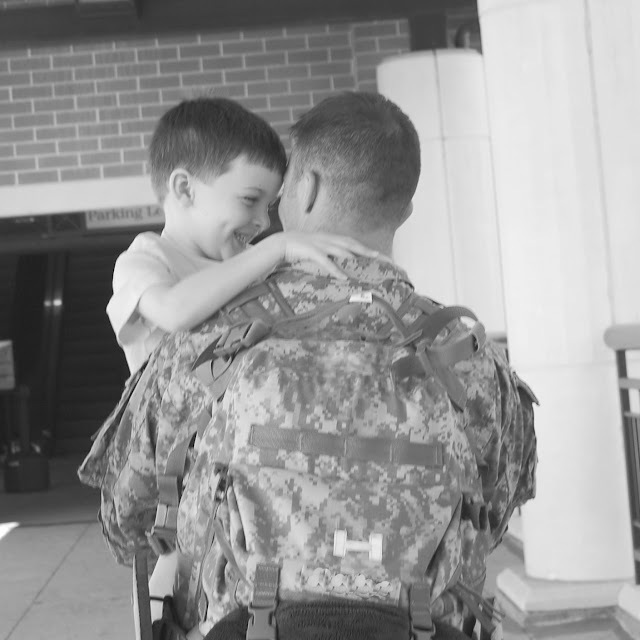 I tell him how we need to be thankful and really appreciate what the military families do for us. It's not just the soldiers who sacrifice. It's their entire family. The wives, kids, moms, dads, brothers, sisters...the list goes on and on. He knows that Jonathan and Reese have Army dads. Whenever we talk about the military he always says Jonathan and Reese have dads that do Army stuff like daddy used to do. I think it's so important for children who don't have military parents to be taught that because of those moms and dads who don't always get to be there we have the freedoms and privileges that we have.